Until the 1960s, Venus was often considered a "twin sister" to the Earth because Venus is the nearest planet to us, and because superficially the two planets seem to share many characteristics. Venus is the second planet from the Sun, with a nearly circular orbit having an average radius of 0.7 A.U. This gives it an orbital period of 225 days. Venus is peculiar in that its rotation is retrograde (in the opposite sense of the Earth and all other planets except Uranus) and because it is very slow: a day on Venus corresponds to 243 Earth days. At present, we have no solid explanation for why this is so. The most plausible theories invoke the collision of two large masses to form Venus in just such a way to cancel most of the rotation for the two masses. Like Mercury, but unlike the other planets, Venus has no moons. The radius of Venus is almost exactly that of the Earth. Its average density is 5.2 g/cc, which is slightly less than that of the Earth or Mercury, but suggests a dense iron core and internal structure similar to that of the Earth. Venus has an extremely weak magnetic field, but that may be a consequence of its having such a slow rotational velocity. Venus is always covered by a thick layer of clouds that make it impossible to see the surface for light in the visible part of the spectrum. Light at radar wavelengths penetrates the cloud deck and allows us to study the surface. A comparison of the motion of the surface with that of the upper clouds indicates that while the surface takes about 8 months to rotate, the clouds rotate all the way around the planet in about 4 days. This indicates that there are very high velocity winds in the upper part of the Venusian atmosphere. Missions to the surface of Venus (Russian Venera spacecraft) indicate that the cloud deck begins about 50 km above the surface. Spectral analysis of the thick cloud layer surrounding Venus suggests that the clouds are largly composed of sulphuric acid droplets. The cloud layer is rather featureless in visible light, but shows structure in other wavelengths. The adjacent image shows the clouds photographed by Pioneer 10 at UV wavelengths and computer enhanced to accentuate differences. Different wavelengths of light penetrate the atmosphere to varying degrees and therefore may be used to study different layers of the clouds and atmosphere. For example, the following images show the clouds of Venus imaged in visible light (with a violet filter), ultraviolet light, and infrared light respectively. A comparison of surface and upper cloud velocities indicates that there are winds in the upper part of the Venusian atmosphere with velocities as large as 300 km/hour. These winds are comparable in speed to jetstreams in the Earth's atmosphere, but extend over much larger regions in the case of Venus. It is not fully understood why these winds have such high velocities. The clouds contain little water vapor, and there is little evidence for water in any form on Venus. It is speculated that the absence of water is because most water that may have initially been on Venus made its way to the upper atmosphere, where it was broken down by sunlight and interactions with cosmic rays and the solar wind into oxygen and hydrogen, which was then lost to interplanetary space. The atmosphere of Venus is composed of about 96% carbon dioxide, with most of the remainder being nitrogen. The atmosphere appears to be relatively clear until the cloud deck starts about 50 km above the surface. As noted in the previous section, the clouds are composed of sulphuric acid and various other corrosive compounds, and the atmosphere contains little water. The pressure of the atmosphere is about 90 times that of the Earth at the surface, and the surface temperatures on Venus are around 500 degrees Celsius, exceeding that of Mercury and hot enough to melt soft metals. Calculations indicate that for the temperatures to be so high there must be a mechanism in the Venusian atmosphere that traps solar radiation very effectively. As we will see in the next section, these rather remarkable properties of the atmosphere are thought to be a consequence of a runaway greenhouse effect. There are high-velocity winds in the upper atmosphere, but the atmosphere below the cloud deck appears to be relatively stagnant, with only very weak winds blowing at the surface. Convection driven by differential solar heating should give rise to winds of only a few meters per second, so the high velocity upper level winds, and the contrasting stagnation of the lower atmosphere, are not well understood. The Earth and Venus are near each other in the Solar System, and are similar in size, density, and composition. Based on our understanding of the origin of the Solar System, we would expect that their initial atmospheres would have been rather similar. Yet the present atmospheres of the two planets could hardly be much more different than they are. How did this come to be? The reason is thought to lie in what is termed the "Runaway Greenhouse Effect". The greenhouse effect occurs for all planetary atmospheres containing greenhouse gases, and is responsible for their being warmer than would be the case otherwise. The greenhouse effect by itself could not account for the conditions that we find on Venus. However, under certain conditions we believe the greenhouse effect can "run away". For example, consider the case of a planet like the Earth. The Earth has enormous amounts of two greenhouse gases: water vapor and carbon dioxide. However, for the Earth most of the water and carbon dioxide are not in the atmosphere. The water is mostly in the oceans, and the carbon dioxide is mostly bound chemically in rocks made from compounds that chemists call carbonates (for example, limestone). Now suppose we increased the effectiveness of greenhouse heating of the Earth's atmosphere, for example by increasing the amount of solar radiation falling on it, or by increasing the concentration of greenhouse gases in the atmosphere (for example, by burning fossil fuels, which produce water vapor and carbon dioxide as byproducts of burning). We would then expect the temperature to rise in the atmosphere (assuming no other effects intervened---a big "if" in the realistic case since the atmosphere is complicated). This would be a greenhouse effect. It would become a runaway greenhouse effect if the rising temperature approached the boiling point of water, because then the oceans would begin to convert to water vapor, the water vapor would increase the effectiveness of heat trapping and accelerate the greenhouse effect, this would cause the temperature to rise further, thus causing the oceans to evaporate faster, etc., etc. (This type of runaway is also called a "positive feedback loop".) When the oceans were gone the atmosphere would finally stabilize at a much higher temperature and at much higher density, because all the water would now be in the atmosphere. We can envision even a further runaway stage in this scenario. Suppose the preceding runaway raised the temperature so high that chemical reactions begin to occur that drive the carbon dioxide from the rocks into the atmosphere (the process is called sublimation; a few hundred degrees Celsius would be sufficient). Then another runaway would occur as the carbon dioxide feeding into the atmosphere would accelerate the heating, which would in turn accelerate the transfer of carbon dioxide from the rocks to the atmosphere. The atmosphere would finally stablilize at a still higher temperature and pressure after all the carbon dioxide had been driven from the rocks. In fact, we believe that if this sequence were to take place on the Earth, the resulting temperature and pressure of the atmosphere left behind would not be very different from that for present-day Venus: the atmospheric termperature would be hundreds of degrees Celsius and the pressure would be maybe 100 times greater than it is today. Thus, we believe that in the case of Venus the initial solar heating kept oceans from forming, or kept them from staying around if they did form, and the subsequent lack of rainfall and failure of plant life to evolve kept the carbon dioxide in the atmosphere rather than binding it in the rocks as is the case for the Earth; thus, Venus has an environmental disaster for an atmosphere. The sobering warning for us is obvious: we have to be extremely concerned about processes such as burning of fossil fuels in large volumes that might (we don't know for sure because the scientific questions are complex) have the potential to trigger a runaway greenhouse effect and produce on the Earth atmospheric conditions such as those found on Venus. Our knowledge concerning the surface of Venus comes from a limited amount of information obtained by the series of Russian Venera landers, and primarily from extensive radar imaging of the planet. The radar imaging of the planet has been performed both from Earth-based facilities and from space probes. The most extensive radar imaging was obtained from the Magellan orbiter in a 4-year period in the early 1990s. As a consequence, we now have a detailed radar picture of the surface of Venus. The adjacent animation shows the topography of the surface as determined using the Magellan synthetic aperture radar (black areas are regions not examined by Magellan). An MPEG movie (303 kB) of this animation is also available. The surface of Venus is rather smooth in many places, though not nearly as smooth as originally expected . However, we find evidence for many of the same geological features found on Earth: canyons, volcanoes, lava flows, rift valleys, mountains, craters, and plains. There is substantial evidence for local tectonic activity but the surface appears to be a single crustal plate, with little evidence for large-scale horizontal motion of crustal plates as found on the Earth. Why the two planets differ in this aspect of their geology even though we believe them to have similar interiors is not well understood. The usual explanation is that Venus is a little behind the Earth in geological timescale, and its tectonic activity is just getting started. Much of the surface of Venus appears to be rather young. The global data set from radar imaging reveals a number of craters consistent with an average Venus surface age of 300 million to 500 million years. There are two "continents", which are large regions several kilometers above the average elevation. These are called Istar Terra and Aphrodite Terra. They can be seen in the preceding animation as the large green, yellow, and red regions indicating higher elevation near the equator (Aphrodite Terra) and near the top (Ishtar Terra). The following images show 5 hemispheric views of the surface, again as determined primarily from the Magellan mission. The center image (a) is centered at the North Pole. The other four images are centered around the equator of Venus at (b) 0 degrees longitude, (c) 90 degrees east longitude, (d) 180 degrees and (d) 270 degrees east longitude. The simulated hues are based on color images recorded by the Soviet Venera 13 and 14 spacecraft. We now survey a few of the prominent types of surface features that have been discovered on Venus. 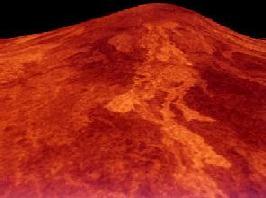 Venus has high mountains, many of which appear to be volcanic in origin. The bright region near the center in the polar hemispheric view (a) above is Maxwell Montes,the highest mountain range on Venus; it reaches an elevation of 11 km above average elevation (2 km more than the elevation of Mount Everest above sea level on Earth). There is strong evidence that volcanoes have erupted on Venus in the geologically recent past, and strong indirect evidence from observations like changing chemical composition of the atmosphere and the detection of lightning in certain regions that volcanoes are presently active on Venus, though we do not yet have direct proof. (Here is a map of volcanic structures on Venus.) One piece of evidence for recent volcanic activity is the presence in many regions of features that look like relatively new lava flows. The two images shown below illustrates a volcano about 3 miles in diameter near Paragon Chasma (left) and an image of apparent recent lava flows in the Sif Mons region. In all of these radar images you should bear in mind that bright spots correspond to regions that reflect more radar waves than other regions. Thus, if you could actually see these regions with your eyes the patterns of brightness and darkness would probably not be the same as in these images. However, the basic features would still be the same. There are rift valleys as large as the East African Rift (the largest on Earth). The image shown below illustrates a rift valley in the West Eistla Region, near Gula Mons and Sif Mons. The perspective in cases like this is synthesized from radar data taken from different positions in orbit. The East African Rift on Earth is a consequence of tectonic motion between the African and Eurasian plates (the Dead Sea in Israel is also a consequence of this same plate motion). Large rift valleys on Venus appear to be a consequence of more local tectonic activity, since the surface of Venus still appears to be a single plate. The surface of Venus has been smoothed by recent lava flows and by interaction with the corrosive atmosphere. However, there are various examples of meteor craters. The following images show a field of craters (left) and the largest crater found (right). Finally, we show two of the images taken by the Russian Venera 14 lander. 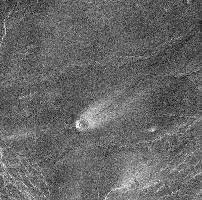 The image is poor quality, but we can see in black and white the bottom of the spacecraft, rocks on the surface, and a portion of the horizon. We close the discussion of Venus by noting that despite the original prejudices that Earth and Venus were sister planets, there are many differences between them. Among them we may list the following features of Venus that differ substantially from the corresponding situation for the Earth. The lack of a satellite. The extremely weak magnetic field. The high surface temperature and dense atmosphere. These and other differences, only some of which we understand well, suggest that we still have a lot to learn about our "sister planet".